I'm not a Cubs fan, and I probably would have done the same thing. But you gotta feel bad for this guy. He's in hiding because the entire city of Chicago wants to kill him. That can't be a good feeling. 20 Worst NES Games - A good list of some ridiculous games. I've seen ill-conceived films before, but this almost takes it to a new level. I somehow picked this up on Canadian VHS and I'm having a hard time sitting through it right now. It's got something to do with space or something, but it's more of like a low budget Jetsons with fart jokes. 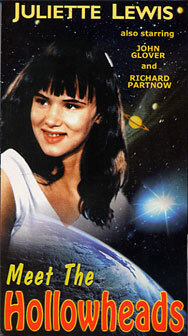 Features a young Juliette Lewis and the creepy old lady from Goonies. Oh, and the little lesbian looking kid from The River's Edge. In what can only be described as severely surreal, here's Randy Savage's rap album. I guess it could also be described as one of the most awkward and terrible things I've ever heard. He spends most of the album dissing Hulk Hogan and then at the very end does a tribute to Mr. Perfect. And, no mention of the death of Miss Elizabeth. My favorite track: "Macho Thang." pardon me Ptooie! - An inside joke based on the strategy guide for Super Mario 3. Basically a funny way to tell people to get the hell out of your way. Usage - "Dude, that coug I was with last night wanted to give me the taintalingus and all I wanted to do was play super no friendo." "Dude, you gotta look her right in the grill and say pardon me Ptooie!" 07. Dude: two chicks, a rocks glass, and me!